Form 26AS is a consolidated tax statement issued to the PAN holders. It is also known as Tax Credit Statement or Annual Tax Statement. To view Form 26AS or download Form 26AS from the Income Tax Website, read our complete guide on How to View Tax Credit Statement (Form 26AS). In this guide we will understand Form 26AS and all its parts in detail. 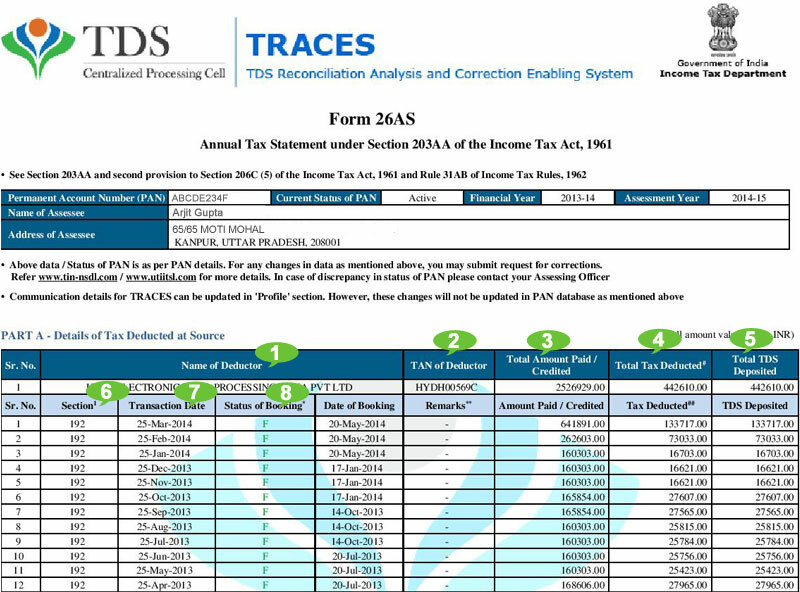 Part A of Form 26AS reflects the income earned by an individual on whom TDS is deducted that includes Deductor name, TDS amount, Salary, Interest, Commission, Professional Fees etc. 1. Name of the Deductor Deductor refers to a Corporate, an Organization or an Employer which deducts the TDS from the payments made by an individual. For example, if an Employer deducts TDS from salary, then the Employer’s name will appear in the respective column. Similarly, if a Bank has deducted any TDS on interest paid on FDR’s, the name of the Bank will be reflected. 2. Tax Deduction Number (TAN) The TDS department of Income Tax allots a unique identification number (TAN) to the companies who are liable to deduct TDS. Employer deducts TDS on salary payments, Bank deducts TDS on interest payments and Insurance companies deduct TDS on commission payments. It is mandatory to include TAN during efiling the Income Tax Returns. Referring an incorrect TAN may lead you into trouble and you may not get credit of taxes. 3. Total Amount paid/credited It refers to the total amount paid by the Bank to you during the financial year. It is relevant in case you are unable to figure out how much income has to be shown in ITR for which TDS was deducted. In such a case, you can use Form 26AS to verify the details. 4. Total Tax Deducted (TDS) The Company deducts amount in the form of income tax and deposits to the Government on your behalf. Cross-verifying the TDS in Form 26AS provides assurance that you are able to claim correct and full amount of TDS in your Income Tax Return. 5. Total Tax Deposited The Deductor deposits the amount of Income Tax/TDS to the Income Tax Department. 7. Transaction Date Payment date and deduction of TDS. 8. Status of Booking It lets you know that whether Income Tax department has provided the final credit of TDS or not. If the status is ‘F’, it shows that Income tax department has finally given you the credit of TDS. If the status is ‘U’, credit of TDS is ‘Unmatched’. In this case, you will not be allowed the credit of TDS. 1. Name of the Deductor Deductor refers to a Corporate, an organization or an Employer which deducts the TDS from the payments made by an individual. For example, if a Bank is liable to deduct TDS on Interest paid on FDRs, the name of the Bank will be reflected. 2. Tax Deduction Number The TDS department of Income Tax allots a unique identification number (TAN) to the companies who are liable to deduct TDS. Employer deducts TDS on salary payments, Bank deducts TDS on interest payments and Insurance companies deduct TDS on commission payments. It is mandatory to include TAN during efiling the Income Tax Returns. Referring an incorrect TAN may lead you into trouble and you may not get credit of taxes. 5. Total Tax Deposited The amount of Income Tax / TDS which is actually deposited by the Deductor to the Income Tax Department. With effect from April 1 2014, the buyer of Immovable properties such as land, building, flats, plot, etc are required to deduct TDS from the payments which are going to be made to seller. The buyers are required to deposit the TDS which is deducted to the Government of India. Also, they should complete an online form/return which details about the property, seller, PAN and so on so that they can get credit of TDS deducted. So, Part A2 is relevant for Seller who’s TDS has been deducted from the payment for selling the property. 1. TDS Certificate Number It is a unique identification number allotted to each TDS Certificate generated from the TRACES website. 2. Name of the Deductor Deductor refers to a Corporate, Organization, Employer which deducts the TDS from the payments made by an individual. In this case, buyer of property deducts TDS and therefore buyer’s name will be reflected. 3. PAN of Deductor Permanent Account Number of the buyer who has deducted the TDS. 4. Acknowledgement Number The buyer of property after deducting TDS is mandatory to complete an online form in the Income Tax Department website which details PAN, Name, Amount, and description of Property involved. After successful submission, an Acknowledgement number is generated which is reflected in this column. 5. Total Transaction Amount The Gross Total Amount of the deal on which TDS is deducted. 6. Transaction Date Date on which TDS is deducted by the buyer of property. 7. TDS Deposited Total amount of TDS deposited to Income Tax Department. 8. Date of deposit Date on which TDS is deposited by the buyer of the property. 9. Status of Booking The status lets you know if Income Tax department has given you the final credit of TDS or not. If the status is ‘U’, credit of TDS is ‘Unmatched’. In such a case, you will not be allowed the credit of TDS. Under this Section you will be able to locate the details of Income Tax Paid by you in the form of Advance Tax or Self Assessment Tax. Part C of Form no.26 AS is of great help at the time of efiling of income tax return as one can easily refer to this part to fill out the details of Advance Tax / Self Assessment Tax in the Income Tax Return. 3. Tax Amount of tax paid. 4. Surcharge Amount of Surcharge paid on Tax. 5. Education Cess Amount of Education Cess paid. 6. Others Amount of any interest or penalty deposited. 7. Total Tax It is the amount of total tax deposited. 8. BSR Code Basic Statistical Return Code. BSR Code is a 7 digit unique code allotted by RBI to all the banks and their branches in India. When a tax payer deposits income tax/TDS at the bank, then an acknowledgement receipt is provided to the tax payer from the Bank for depositing the income tax. The acknowledgement receipt contains BSR code of the bank, branch that has accepted the payment. Through BSR code, it is easy to identify the branch of the bank. 9. Date of Deposit Date on which income tax was deposited. 10. Challan Serial No Banker provides an acknowledgement receipt to the tax payer for depositing the income tax. The receipt contains a serial number which is also called as Challan Serial Number. Part D of Form 26AS contains relevant information about the income tax refund paid by the Income Tax Department. If the tax payer is unable to recollect or to know about the status of refund from Income Tax Department, the tax payer can browse Part D of Form 26AS to trace the date of refund, if any refund has been paid. If no information appears, it implies that there is no refund till the date of generating Form 26AS. If an individual is confident about refund and if there is no information appearing in Part D, the tax payer should verify the Refund Status. 1. Assessment Year for which refund has been paid It point towards the relevant assessment year for which the Income Tax Department has paid the refund. For example, if Assessment Year appears as 2013, it means that information pertaining to Assessment Year 2012-13 and Financial Year 2011 – 12 appears. 2. Mode of payment of Refund It represents the type of payment by paper mode (check) or ECS. 3. Amount of Refund Paid Full amount of income tax refund paid. 4. Interest on Refund Amount of interest on income tax refund paid by Income Tax Department. 5. Date of Payment of Refund Date on which the Income Tax Department has paid the income tax refund. AIR refers to Annual Information Return. If an individual enters in certain financial transaction specified by Income Tax Department, the other party is required to file an AIR with the Income Tax Department with PAN of the person and nature and amount involved in that transaction. For example, if you purchase Mutual Fund for 2 lakh Indian Rupees during a Financial Year, the Mutual Fund company should file an AIR with Income Tax Department which contains Name, PAN, and total amount of Mutual Funds that you purchased. As soon as the Company files an AIR, similar information will be reflected in Part E of Form 26AS. Therefore, Part E of Form 26AS contains all the relevant information about the specified financial transaction for which AIR was filed. Part E is very important as it serves as a red alert that Income Tax Department has readymade information at its finger tips for the financial transaction done by you and therefore you should not miss to efile the Income Tax Return and should also disclose all your sources of Income which gave raise to these Financial transactions. 1. Type of Transaction Please refer to the following table to know the meaning of codes and their description. 003 - Receipt from any individual of an amount of two lakh rupees or more for purchasing the Mutual Fund units. 004 - Receipt from any individual of an amount of five lakh rupees or more for acquiring the Bonds or debentures issued by a Company or Institution. 005 - Receipt from any individual of an amount of one lakh rupees or more for acquiring the Shares issued by a Company. 008 - Receipt from any individual of an amount of five lakh rupees or more in a Year for investment in Bonds issued by Reserve Bank of India. 2. Name of AIR Filer Name of the company who has filed AIR. 3. Transaction Date Date on which the financial transaction was made. 4. Single / Joint Party transaction Transactions done by a single or joint party. 5. Number of parties Number of parties involved in the transaction. 6. Amount Total amount of final transaction. 7. Mode Mode of payment. 1. TDS Certificate No. A unique identification number allotted to each TDS Certificate generated from the TRACES website. 2. Name of Deductee Deductor is the one who deducts TDS. In this case, seller of the property deducts TDS and therefore the seller‘s name is reflected. 3. PAN of Deductee Permanent Account number of the Seller who has deducted the TDS. 4. Acknowledgement Number The seller of property after deducting TDS should complete the online form at Income Tax Department website. The form contains information about PAN, Name, Amount and Description of Property involved. After successful submission, an Acknowledgement number is generated which is reflected in this column. 5. Total Transaction Amount Gross Total Amount of the deal on which TDS is deducted. 6. Transaction Date Date on which TDS is deducted by the Seller of the property. 8. Date of Deposit Date on which TDS is deposited by the Seller of the property. 9. Status of booking It lets you know the status of final credit of TDS from the Income Tax department. If the status is ‘U’, credit of TDS is Unmatched. In such a scenario, you will not be allowed the credit of TDS. Status of Booking in Part A & Part B of Form 26AS could be F/U/P/O. F Final. Payment details of TDS/TCS deposited in the Bank by Deductor have matched with payment details as mentioned in the TDS/TCS statement. U Unmatched. The Deductor has not deposited taxes or has furnished incorrect particulars of tax payment. Final credit will be reflected only when the payment details in Bank matches with details of deposit in the TDS/TCS statement. P Provisional. Provisional tax credit is affected only for TDS/TCS statements filed by a Government Deductor. The status will be changed from P to F after verifying the payment details submitted by Pay & Accounts Officer (PAO).